Mixed patterns are a trend that first made an appearance during New York Fashion Week in fall of 2016. Bear in mind that home décor trends are a reflection of what is seen on the runway, as it is what precipitates what is to come in the home. Pieces with mixed patterns were once a fashion faux pas, but this year is saying farewell to statement pieces being too busy. In fact, 2017 welcomes enticing and mismatched patterns. One can almost attest that this trend is perhaps bohemian-chic, as it portrays a nonconformist and free spirited look. This is especially seen in the bedroomthis year. Check out our variety of mixed patterned bedding. This bedding set was designed for a girl’s bedroom. Nothing about the color, texture and pattern says conventional. However, this patchwork design is sweet, yet grown-up and will give any little girl’s room a unique style. The Damani quilt will simply delight your bedroom with its quaint twist on the classic patchwork design. It features beautiful soft and muted colors that are easy on the eyes. The toned down color scheme is said to create a certain sophistication. This bedding is representative of the typical family heirloom style. It features a hand-quilted texture with a brilliant patchwork design. The fabrics each tell a story of their own. The colors are muted and quite feminine, which make this quilt an exquisite choice for a young woman’s room. If you’re looking to create an avant-garde and unconventional style in your bedroom, then mixed patterns is the way to go! It’s the perfect opportunity to express your inner hippie, by setting an atmosphere with happy tones. You just may capture that eclectic charm with artistic elements that you’ve been longing for. Perhaps one of the hottest home design trends to make an appearance in 2017 will be marble without a doubt! Design experts predict that marble will not only become an increasingly sought after material for countertops, flooring and backsplash, but there will be a surge in demand for household furniture and home decor. In fact, some of the staple furniture pieces will be buffets, occasional tables and home decor. Let’s take a look at how the marble trend will affect these categories. As you know, the buffet compliments your diningroom, by storing your favorite china and displaying your family keepsakes and heirlooms. It adds depth to the room, all while offering extra storage space. When marble is mixed in the equation, you get a beautiful and timeless design. The popular marble buffet features a faux marble top, a light brown finish, open storage shelves, three draws and dark hardware to add a pop of color. Bear in mind the same beauty for a contemporary tablelamp or floorstanding lamp. If you loved the picture you painted so far with the buffet, then you will surely find that adding this accessory to your occasional table, your desk or in a corner beside the sofa is a great way to emphasize luxury. Picture a beautiful arc-style design, an adjustable post, a brushed silvertone metal and a marble foot. The Asabi lamp is just what your need to have your room scream luxury. Last but not least, the Radilyn occasional tables will project elegance right in the center of your conversation space, as it will tie together your living room seating. Not to mention it will serve you well to rest refreshments for your guest! 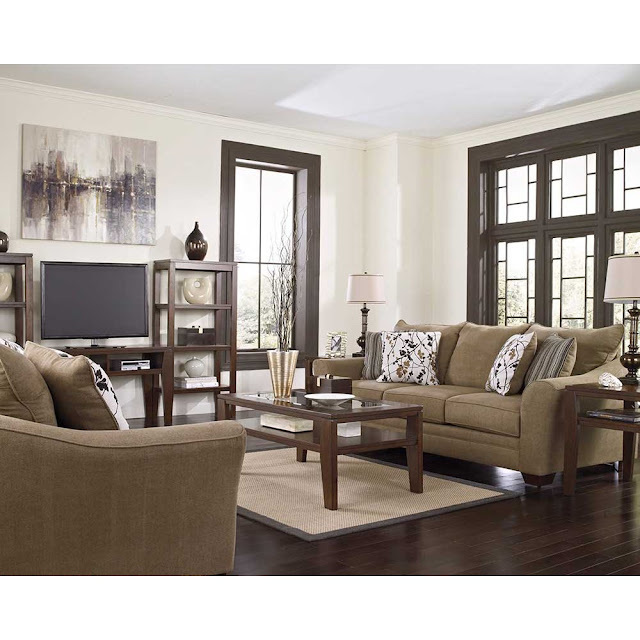 Even on days that they will stand alone, the focal point of your living room will embody a certain refinement. Adding these pieces to your home is the perfect stylish solution to creating a touch of elegance. From white to grey and any shade in between, faux marble paired with either a wood byproduct or steel will capture much of the refinement seen in some of the most beautifully designed homes. Every year in the Spring, the color palette changes. Trends come and go based around these colors, and we tend to shift our home decor, furniture, and overall design themes as a result. It’s incredible, the amount of influence something as simple as a color palette can have, but it also makes a huge statement as to what we find appealing at any given time. This year, of course, is no different. Pantone has been the standard for upcoming color trends for years. They release a ‘color of the year’ that defines trends for 365 days at a time. But, they also release color palette predictions based on seasons. For the upcoming Spring season, it's all about getting back to the natural beauty that surrounds us in different ways. Spring is a time for vibrancy, and appreciating nature. Pantone's upcoming Spring colors absolutely reflect those moods. They're taking a page from Mother Nature's book with colors like Pale Dogwood, Greenery, and Niagara. More subdued and familiar tones like Kale, Hazelnut, and Lapis Blue also make the cut, blending the natural coloring surrounding us with comfortable items we're familiar with. What better time to appreciate the beauty of the natural world than in a blooming, flourishing Spring? Niagara will lead the color palette as the 'it' color for the season. It's denim-like blue reflects an idea of relaxation, comfort, and familiarity. All of the great colors that make the 'top ten' list for the season are designed to do exactly the same. So, as you take a look around you this Spring, and try to decide which color palette to focus on for your home. Take a page from Pantone's book, to select on trend poufs, picture frames, rugs, throws and other decorative pieces that reflect these color palettes. Not only will you be on trend, but nature's color palette will find its way into your home! Here is a fact; everybody has books in their home! Whether you are a passionate reader, a book collector or a person who rarely reads; what do you do with these books? Where do you put them? Surely, we’ve all asked ourselves these questions at some point and came up with this conclusion. 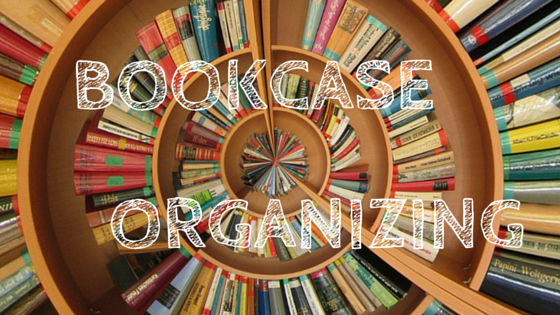 A Bookcase is the most appropriate furniture to organize them. It can actually bring a new look to your home! Are there any rules for bookcases? No need to organize your books on shelves as if you are in a library unless you are a neat freak. 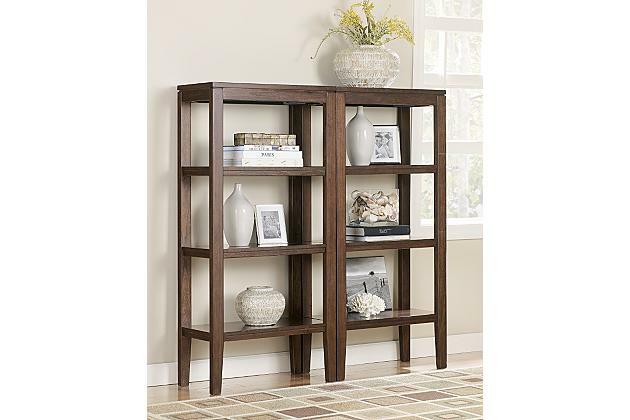 Bookcase shelves can be unstructured masterpieces of furniture where you can also arrange home accents. Be creative in your books arrangement! Place some books horizontally and vertically on the shelves. Magazines and articles can also find some room on the shelves. You can also brighten your shelves by playing with the color of the books while placing them! 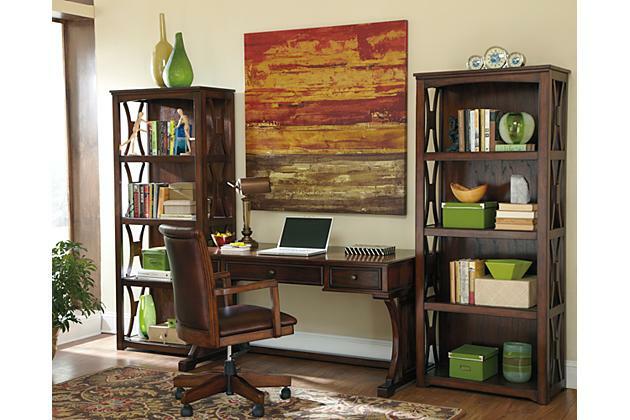 Don’t fall into the classic bookcase use…feel free to add home accents too! Now you can definitely display all of your little collectibles on the shelves. These items will give more perspective and depth to your bookcase; it will surely catch all your guests ‘eyes! 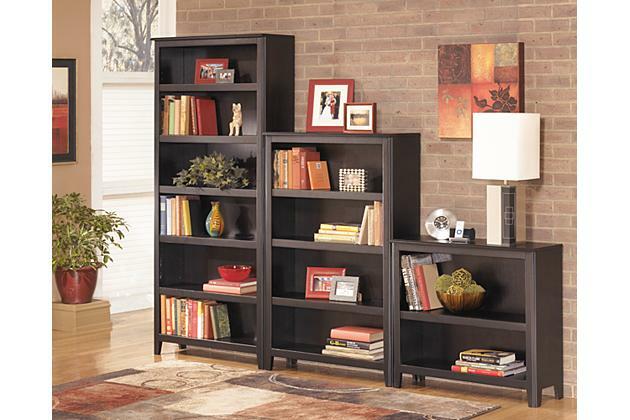 Open bookcase shelves can give a fresh and contemporary look to your room! Dare to innovate in choosing your bookcase. In kids’ room, a bookshelf is a must-have for storage. Kids can arrange books and all their others unexpected items such as dolls, mega blocks or cars in baskets. It is also a great way for parents to teach them at a young age how to be organized, in hopes that they will apply it later on. As a short term solution, their room will stay tidy!